Inside the lab for Dr. Joanna Sztuba-Solinska, you will find her and her team busy at work. Made up of one postdoctoral, three Ph.D. students, and five undergraduates, the lab is full of people and laughter, but also serious work. Dr. Joanna Sztuba-Solinska works with viral long non-coding (lnc) RNAs encoded by gammaherpesviruses, discovering relationships between their structure and function. Dr. Joanna Sztuba-Solinska explains: “To effectively evade the host system, viruses, similarly to their host cells, make lncRNAs. Gammaherpesviruses have been with humans since the beginning of evolution, they acquired the largest number of non-coding RNAs among viruses and, thus, represent good models to elucidate the mechanisms by which these transcripts contribute to dysregulation of cellular processes”. LncRNAs perform their functions through structure-mediated interactions with DNA, other RNAs and proteins. Therefore, in order to understand the functionality of viral lncRNA, Sztuba-Solinska and her team have been addressing the relationship between the various aspects of lncRNA conformation, i.e. secondary structure, tertiary interactions, epitranscriptomic modifications, and lncRNA functionality during viral replication and pathogenesis. 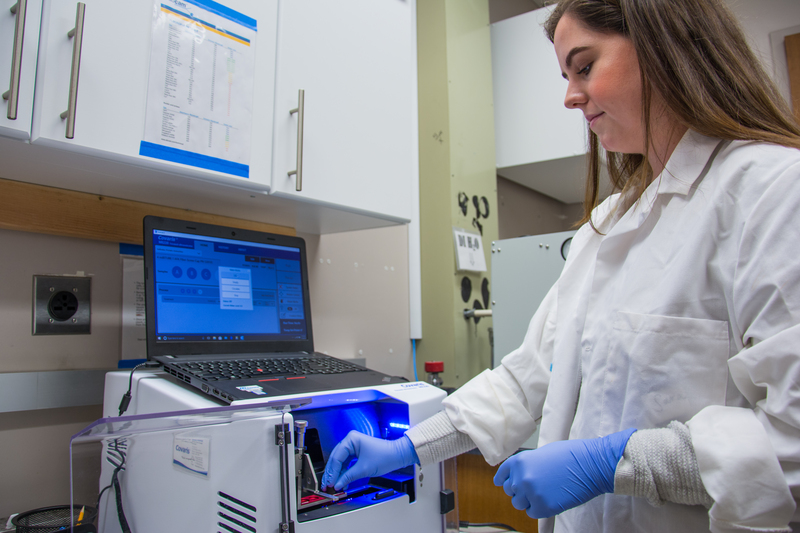 One specific gammaherpesvirus that she works with in her lab is the Kaposi’s sarcoma-associated herpesvirus, or KSHV for short. KSHV is an oncogenic, or cancer-causing virus that affects HIV positive and immune-comprised individuals. The most abundant KSHV-encoded lncRNA is polyadenylated nuclear (PAN) RNA, which acts as a major switch during viral lytic reactivation. Sztuba-Solinska and her team investigate the structure-to-function relationship of KSHV PAN lncRNA using an authentic tumor models: primary effusion lymphoma cell lines comprised of malignant, KSHV infected B cells. She grows infected cells, extracts total RNA and captures target PAN RNA with oligonucleotide probes. Subsequently, she uses state-of-the-art RNA-centric techniques, like SHAPE-MaP and RNA antisense purification to address PAN lncRNA structure, function and interactions with other molecules. The overall goal of Sztuba-Solinska research is to find “weak-spots” in viral lncRNA interactome network that can be targeted with novel therapeutic strategies to combat viral infections. Sztuba-Solinska is on the frontline of the new RNA-centric technologies involved in this kind of research. She has published one of only two papers that used SHAPE-MaP, a new method that allows researchers to probe the structure of any RNA of interest inside the living cells or within viral particle. “Research is new on viral non-coding RNAs structure and functions,” Sztuba-Solinska stated when asked why she chose this field of study. She also listed off that her curiosity about lncRNA drug-ability with small molecule peaked her interest. “RNA is no longer perceived as an inert molecule that simply passes information from DNA to proteins, but rather as a target for the development novel therapies” she stated. However, effective targeting of viral lncRNAs necessitates comprehensive understanding of their structure and functionality. Sztuba-Solinska advises students interested in research to look for studies that fascinate them. She said that while being in a lab can be intimidating, students learn best with practice. 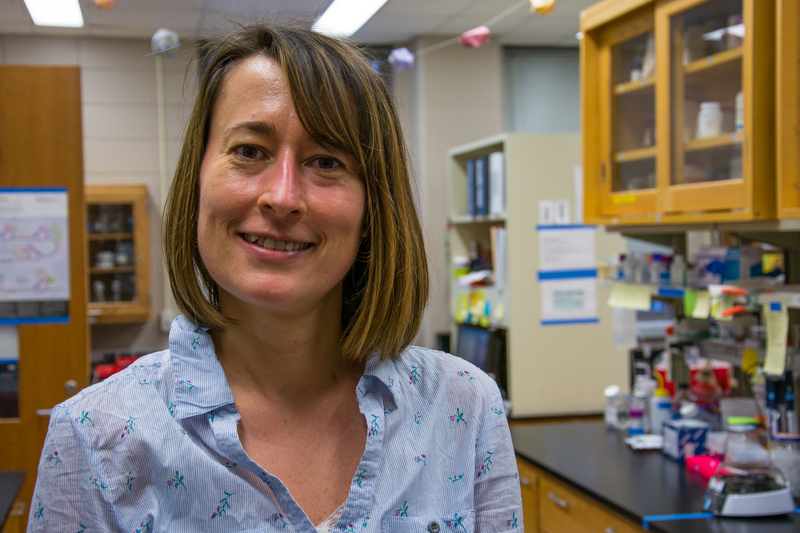 Dr. Joanna Sztuba-Solinska focuses her research on viruses and RNA. 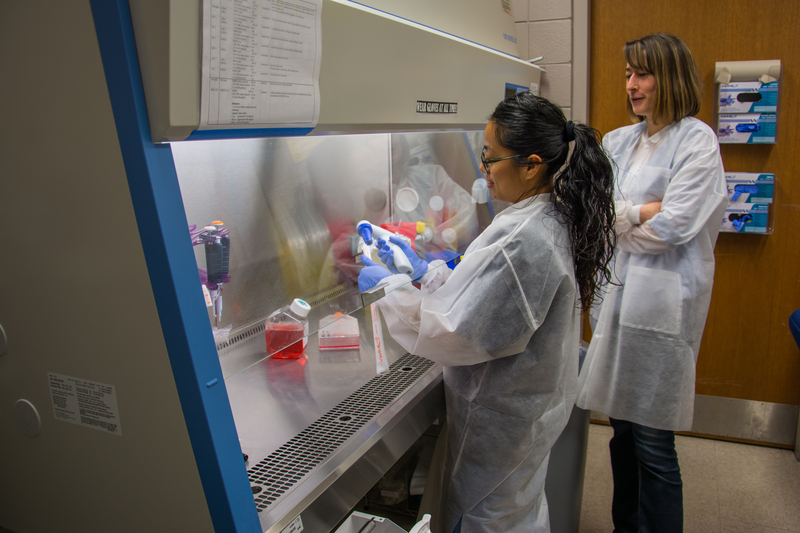 Dr. Sztuba-Solinska and post-doctoral researcher Gabriela Chavez Calvillo work with specimens. 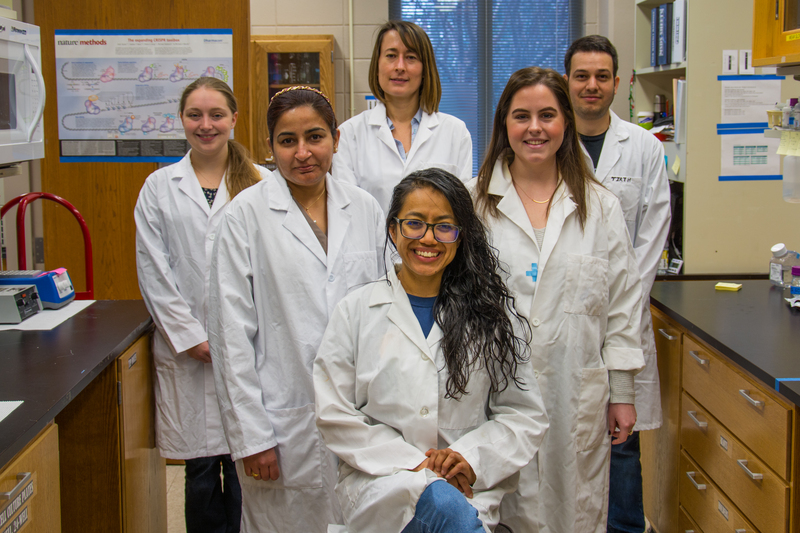 Dr. Joanna Sztuba-Solinska and her lab team. 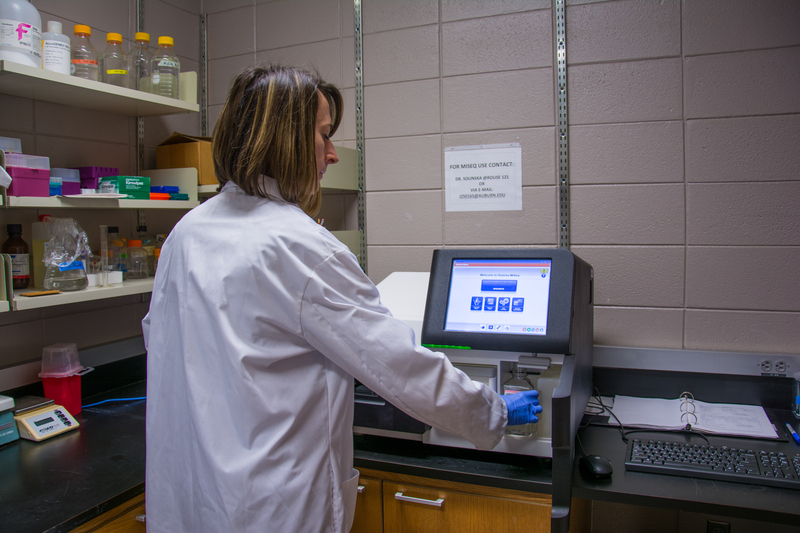 Ph.D. student Sarah Martin using equipment to analyze a sample. 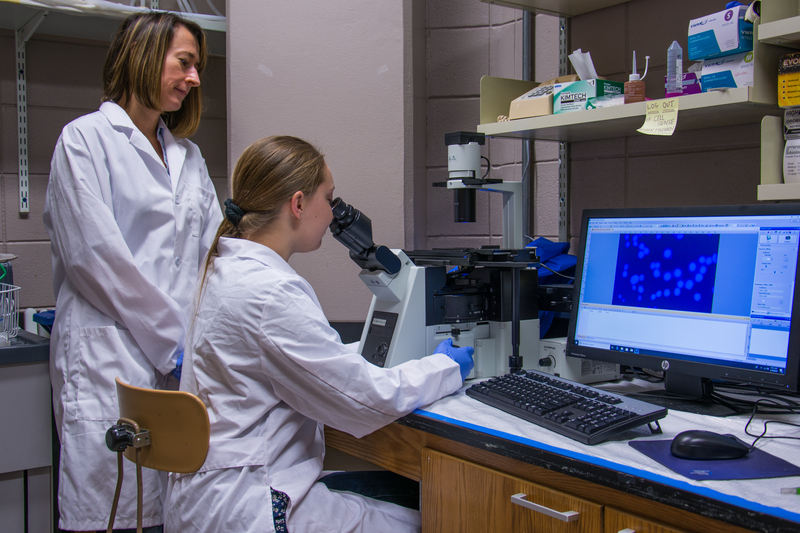 Undergraduate student Sabrina Cline and Dr. Sztuba-Solinska use fluorescent microscopy to study a sample. Dr. Sztuba-Solinska collecting data from a high-powered machine.